Worst Real Estate Investments Possible. Jack and Jill have seen it all. Jack Butala: Worst Real Estate Investments Possible. Leave us your feedback for this podcast on iTunes and get the free ebook at landacademy.com, you don’t even have to read it. Thanks for listening. Jill DeWit: First Friday in 2017. Woohoo! Jill DeWit: Did you make through your first week? Jill DeWit: Are you suffering? Jack Butala: It was a long holiday season. I love being back to work now. Jill DeWit: What? What? What? Jack Butala: In this episode, Jack and Jill … Jill’s gonna get me for that in a minute. 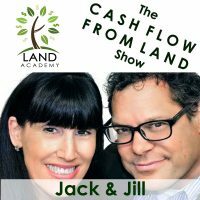 Jack Butala: In this episode, Jill and I talk about the worst real estate investments possible. We’ve all been there. Maybe you’re there right now. Let’s take a look. But first let’s take a question posted by one of our members. From the landacademy.com online community. It’s free. Jill DeWit: Cool. Luke, I’m not sure which one in our group said, because it’s such a good question it could be either one of them. They’re both smart. How do I create easements? Jack Butala: This is a great question. Jill DeWit: Could I just write up my own easement on the deeds. I kind of like this. To give access to the back lot across the front lot of which I own both. Jack Butala: Yeah. Put whatever you want in that deed. Jill DeWit: I think that’s kind of cool. I like that. Jack Butala: I really don’t like my fourth child. Can I just reprogram his brain how I want? Jill DeWit: That’s good. I like that. Jack Butala: No, you can’t just put an easement on a deed. In 1952 you might have been able to do that. Jack Butala: But, no. You have to file for easements with the county. I mean, maybe there’s a county out there that still allows you to do that. There are counties that certainly allow you, that are agricultural-based, they allow you split off property if you’re deeding it to a family member or they allow you to split off property only to certain numbers, but for easements, you have to file a whole plan. Here’s the takeaway, Luke, and you’re right. Both of these guys … This is PhD level stuff. Jack Butala: An easement, for the record, is a right of way across someone else’s property, an adjacent property to property that you own, so you can get there. So you can get to your own property. So you have to file a bunch of stuff and you have to … The best way to do it is to get ownership consent from that property. I should say that all the statutes, or nearly all of them that I’ve ever seen say if you own property you can’t reasonably withhold access to another person’s property. So you can ram it down the owner’s throat or you can just call in and say, “I’d really like to put a road in or put a platted easement in here.” If you see dotted lines on a plat map, that’s usually the easement. The solid line is the property line. So, no, you can’t just write your own easements in. Nine times out of 10, the easements aren’t written in the deed anyway. You might see them sometimes in the old school ones where they’re talking about minutes and degrees and things like that, but in general, the easement, it’s separate. It’s separate from the deed. It’s real hard to answer this without visuals. Every kind is different. Jill DeWit: It’s true. I think I know where he’s … You know where I think? I think I know where he’s getting it, because some of the people that I buy property from and we buy property from, they’ve owned it for so long, they do have it written in the legal description. Jill DeWit: So it has to be a certain wording and stuff. Jack Butala: Fence went east. Jack Butala: Or, you know, it’s 14 degrees west, yeah. Jill DeWit: You know, and with that special description so I’m sure Luke was going, “Well, shoot. If I just worded this the right way, right? Is there a certain way I have to word it and I can just kind of add it in there,” which makes sense. I would think that, too, but there’s more to it. Jack Butala: Yeah, so, I mean, you never want to record a piece of property with an altered legal description ever. Jack Butala: Take a couple of steps back. Jill DeWit: That’s a very good point. Jack Butala: The legal description that is on the grantor document needs to be verbatim, and I mean every dot and every T crossed properly verbatim. Jill DeWit: As crazy as it might sound, leave it. Jack Butala: To alter an easement. Jack Butala: So the first place you start with stuff like that, is calling the either planning and zoning or, yeah, would be planning and zoning. Jack Butala: You know, I just learned for the first time ever that planning and zoning are sometimes two different departments. Jill DeWit: Oh that’s right. Jack Butala: Not in Santa Barbera. Jill DeWit: When you went to go look for planning and zoning, so planning’s over there and zoning’s over there. Jack Butala: Well, usually it’s one person. Jack Butala: Oh, you mean Mike. Yeah. Here’s Mike’s number. Jill DeWit: Exactly. Mike in planning and zoning. Not Mike in planning and Bob in zoning. Jack Butala: But he’s playing golf today. Jill DeWit: There you go. Exactly. That is really funny that you bring that up. And they have different hours than other people, too, which was funny. Jack Butala: In the title. Right in the title. I did it for you. Jack Butala: Sunshine and rainbows at this point. Jack Butala: Jill, I wrote this title as a response to a lot of questions that I’m getting, and because I did it, the first real estate deal that I ever did was a house deal and it was the worst real estate deal I ever did because I just had no education at all. Jack Butala: I looked at it like it was a house I was buying … You know, I would buy personally to live in. So they get a real estate agent. Maybe it’s their buddy, and they look through the MLS, the multiple listing service and they pick out a property. Or they go driving for dollars and they find a property that’s falling down. Something like that. This is what I see all the time. This is absolutely, by the way, what not to do. So they buy it or they negotiate a great deal. They get $10,000.00 off or something like that. They buy it and they get in there. Try to clean it up. They go get a loan. Right? And the conventional wisdom is try to put as least amount of money down as possible so your monthly payment is, you know, “Hey, if you get … Your monthly payment’s only gonna be $25.00 more if you get X amount down.” You know? I’ve heard it a million times. So now, you got a loan. You’ve obviously signed personally for that. A lot of risk. Jack Butala: Right? Yesterday’s show or two days ago was no risk. Jack Butala: We’ve just spent decades putting together a risk-free real estate situation. There’s not more risk … What I’m describing is the most risky. Jack Butala: Now you’ve a lender involved. You’ve got a real estate agent involved. They’re getting paid. You’ve got an escrow agent involved. They’re getting paid. You got an inspector involved who’s really working for the lender and they’re getting paid, and on and on and on and everybody’s made a bunch of money except you. And so you’re standing there with the keys in your hand looking at a untenantable house that you think you’re gonna rent out or flip or whatever and it doesn’t work. Jack Butala: You get in there and you find out there’s mold and all kinds of stuff. So that is how you try to buy a primary residence as an investor and it’s just absolutely the worst real estate investment you can possible make. You want to remove all those risk characteristics for yourself and flip a property as fast as possible. That’s why we’re here. We spent a career doing that and we’re sharing it with everybody. Jack Butala: What do you see, Jill? Jill DeWit: I was looking at it from our world and our people and I see people … Usually it’s before they got to us and they rushed in, they bought an asset, whether it’s a property or whatever, because they were told it was a good deal. Sometimes they were told it’s a good deal and that was enough for them. I’m like, “What the heck?” Or they assumed it was a good deal. Jack Butala: Yeah. I’ve seen that, too. Jill DeWit: They didn’t know and they didn’t do all the right work and so they either bought something that really wasn’t a good asset or they overpaid. Because often you can fix it. If you buy it right you can still fix it. You can still make some money. Jack Butala: It’s like a marriage. Jack Butala: I can still fix. Jill DeWit: Like a marriage. Oh, that’s where you’re going with that. Jack Butala: If I just get deeper inside. Jill DeWit: I’m like, “[crosstalk 00:09:20] apply it right. What? Jack Butala: If I get deeper inside of him I can fix him. Jill DeWit: Wow. That’s scary. Oh my gosh. That’s so scary. I’m sure people say that. “He was workable. I had something to work, whatever.” That’s awful. That’s another bad investment. Anyway. Jill DeWit: But they rushed in and then they overpaid and that’s the times that I see people getting in trouble. Really when you rush in it’s not like you did the deal too fast. It’s like you didn’t really have everything lined up. You know? It’s just because of experience. Jack Butala: [crosstalk 00:10:01] You don’t tip yourself. Jack Butala: Oh really? You follow specific people? Jack Butala: Wow. That’s cool I never thought of that. Jill DeWit: Yeah. It’s really cool. Jack Butala: Like who do they follow? Do you have any names? Jill DeWit: David. David’s a good one. Jill DeWit: David’s a really good inspirational one, David. Thank you, David. Yeah. We have a couple … We have a lot of good members [crosstalk 00:11:00]. Jill DeWit: I could sit and list a lot of names. Jack Butala: You know, when I was starting out, I wanted it to work so bad that I would start to see things that weren’t there. Too optimistic. Jill DeWit: Uh oh. That’s [crosstalk 00:11:25]. Jack Butala: So I see that. Jill DeWit: That’s not the right thing. Move on. Jack Butala: It was un-researched. Back then, too, it was a lot harder to research stuff. Jack Butala: We have all the answers to all the questions on the planet in your pocket right now on your phone. Jack Butala: This was back in a different time where you just really relied on … You know what? You brought up a great point. You listen to somebody when they’re around. Jack Butala: I never thought of … You know what? You’re right. Maybe you have a bad boss. I had a really bad boss. Jack Butala: In commercial real estate in Michigan. He was just full of crap and really scream at us all the time and when you’re young and impressionable like that it’s not good. Jack Butala: Basically, he was just teaching us to lie. That whole car dealer mentality. Jack Butala: Get it … Get … Stick em. Stick him as good as you can. Jill DeWit: I’ve had that. Jill DeWit: I have had bosses like that. “Hit your numbers.” It’s more about hitting your numbers. It doesn’t matter if it’s the right people or if it’s the right fit or whatever and that sends me … It makes me so angry. Jack Butala: To carry along the point here, the worst real estate … The biggest mistake you can make in a real estate deal, and I’m not talking about commercial at all. I’m talking about if you’re new and you’re independent and you’re just getting started getting a loan. Can you think of anything worse than that? Jack Butala: It starts the clock. Now you got all this pressure. It starts the path of bad decision making. Jack Butala: Look, five grand. Jill DeWit: Right. If you have five grand you’re in good shape. Jill DeWit: That’s a good number. Jack Butala: You can really start doubling your money fast. Jill DeWit: Yeah. Don’t think you’re gonna come into this and just have the education part and be able to pay for the data and then that’s all you need. Jack Butala: Any decision that you make that’s putting pressure or you think that might cause you to do bad deals, that’s the problem. Jack Butala: Here’s a short list. Jill DeWit: Like a wife? Jack Butala: Now you’re gonna make bad acquisition decisions. Jack Butala: I gotta get this thing rented. I gotta sell it. I have to get it rented. I have to, you know, you’re making bad acquisition decisions. Take the pressure off of yourself. Jack Butala: Buy some of these assets that like in our asset … The land assets that we buy are typically a thousand bucks, three thousand bucks. The real good ones are three thousand. Sell it for six or eight, double your money, make a bunch of mistakes. Plan on making mistakes. Jill DeWit: Right. It might take you a month. It might take you a few months because you didn’t know how to market it properly. Big deal. Jill DeWit: You owned it. Jack Butala: Then there’s no pressure. Jack Butala: You’re still getting your bills paid because you have your job. Jill DeWit: Your day job. Jack Butala: Your spouse is still happy because … Tell your spouse about it after your successful, not before. Jack Butala: What’s that saying you say, Jill? Jill DeWit: Oh my god. Jack Butala: Ask for forgiveness. Jill DeWit: It’s better to ask for forgiveness than permission. Easier. Jack Butala: What [inaudible 00:15:21] does on a weekly basis with me. Jill DeWit: Hold on. Do not do this, please. Do not. This is a big deal. “Sweetheart, why is our savings gone?” We don’t want to have those conversations. I do not want those people calling me. “You told my husband.” No. Jack Butala: Oh man. Does that really happen? Jack Butala: No, I mean do they call you saying that? Jill DeWit: Oh no. No, but I’m like it could. Yeah. “This guy Jack told my husband.” Oh no. Jack Butala: Yeah. You want to put yourself in a position to succeed. Jack Butala: Right? You want to get the right education. You don’t want to have a lot of time pressure or money pressure or any of that stuff. Jill regularly says to people. I’ve heard her talk about it on the show, “Now is not the time for you to do this. I know you want to have it happen fast, but you need to save some money.” Really, really. And there’s a ton of things you can do before you can actually invest that’s free. I mean, all over the internet there’s people that have a lot of experience that are just sharing their experience. Jack Butala: Read as much as you can. Jill DeWit: Spend a month in our online community. Read it all. Jack Butala: If you live in a larger area, there’s a ton of free real estate investment groups. Go to MeetUp. You know, meetup.com. There’s a ton of … Most of them are bad. Some of them are good. Just like everything in life. You gotta choose the ones that are good for you. Jill DeWit: I always walk away with something. You know, that was a good tip, though. Going to those, a lot of them, they are still saying, “Drive for dollars” and some weird off thing, slash, however, I always take away something. Jill DeWit: Exactly. That’s usually what I take away. Jill DeWit: Yeah or Jack and I are often like, “This is why we’re successful”, and they’re not getting it. They still don’t get it. Jack Butala: I mean Jill and I go to some pretty high end groups in Los Angeles and I’m telling you right now. Jill DeWit: There’s a lot that just don’t get it. 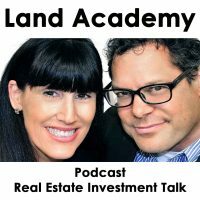 Jack Butala: The average Land Academy member, if they converted what they know to commercial real estate with the right financial backing would do way better than these long term career pros. Jack Butala: Talk about seeing something that’s not there. These people are delusional. Jill DeWit: They don’t get it. Jack Butala: It’s hilarious what they think is good and not good. Jack Butala: A lot of people only think it’s only valuable if there’s a lot of work. Jack Butala: Remember, you used to say that all the time. We should bring that back. Jill DeWit: Yeah, you don’t get a trophy for working 50 hours a week. You know? That’s not the goal here. Jack Butala: If it’s super hard … You had a saying for a while. I haven’t heard you say it in a while. If it’s really really really hard you’re probably not supposed to do it. Jill DeWit: You know? To you, that means it’s … Yeah, it’s meant to be. Jack Butala: If you cringe at the word ‘data’ and ‘spreadsheets’ and ‘analysis’ and [inaudible 00:18:31] scrubbing’ this is not for you. Jill DeWit: If you don’t like talking on the phone, if you don’t want to work with customers, you don’t want to work with the county and line up a notary. That’s def … And that’s okay. Jill DeWit: This is not for you. Jack Butala: Awesome. So don’t get stuck or put yourself in a position where you’re doing a really bad real estate deal just because you want to get out of the situation you’re in or pay off a loan or any of that stuff. Join us in another episode where Jack and Jill discuss how to use information. That’s me. Jack Butala: Just about anything you want. Jack Butala: Do good real estate deals. Good show, Jill. Good week. Jill DeWit: Mm-hmm (affirmative) It was a great week. We’re off to a good start, I think. Our members, our people are so excited. Jack Butala: Year start. Yeah. Jack Butala: I’m real excited about … You know, 2017, from a land acquisition and sales standpoint is probably going to be about the same as ’16 for us, maybe a little better. I’m super excited of what’s going to happen with Land Academy and what’s happening. Jill DeWit: Right. I am, too. Jack Butala: Get offers to owners and land pen and the whole thing. Jill DeWit: What do you think about the economy. I know people ask you that. Jack Butala: Somebody just asked me that. Jack Butala: The real estate economy, so you can almost set your calendar by a 12 to 14 year cycle in real estate and when I say that, I mean mostly residential. With cheap land and data specifically, it never changes. Sales might slow, but there’s always people out there who love to buy land for half of what it’s worth. In the acquisition possibilities, we’re still, I’m still seeing from the last downturn the acquisitions opportunities, it hasn’t waned. Jack Butala: So, about the economy, I don’t think anything’s gonna crash now. Jack Butala: It’s never gonna crash. In our lifetime it’s not gonna have … What happened last time, if you’re really young, if you’re really young, what happened last time was the second worst real estate disaster in the history of this country and that’s not gonna happen. Knock on wood. We’ll see a downturn. We’ll see GDP decrease and some other things and we’ll see a slight growth in new homes and all that, but we’re never gonna see just a massive disaster in this lifetime. Jill DeWit: Too bad we can’t do a limit up/limit down on real estate. You know what I’m talking about? Jack Butala: I bet you could with [inaudible 00:20:57] and stuff. I bet you could. Jill DeWit: But would it save everybody? Jack Butala: Yeah. Oh, you mean like a stop trading. Jill DeWit: Like stock market. Jack Butala: Yeah. Stop trading. Jill DeWit: Yeah where [inaudible 00:21:04] said “limit up, limit down. It’s closed.” Yeah. Jill DeWit: It’s funny I know that stuff. Jack Butala: Bond ratings. Ratings are … That’s a subject for a different show. Jill DeWit: What’s funny because that’s not what we invested. Again, I know what that is. Jack Butala: Yeah. Information and inspiration to buy undervalued property.